The writer Frank Cordaro and his companion Jessica Reznicek have lately stayed in Gangjeong for two months, joining every day’s 100 bows and mass in front of gate. 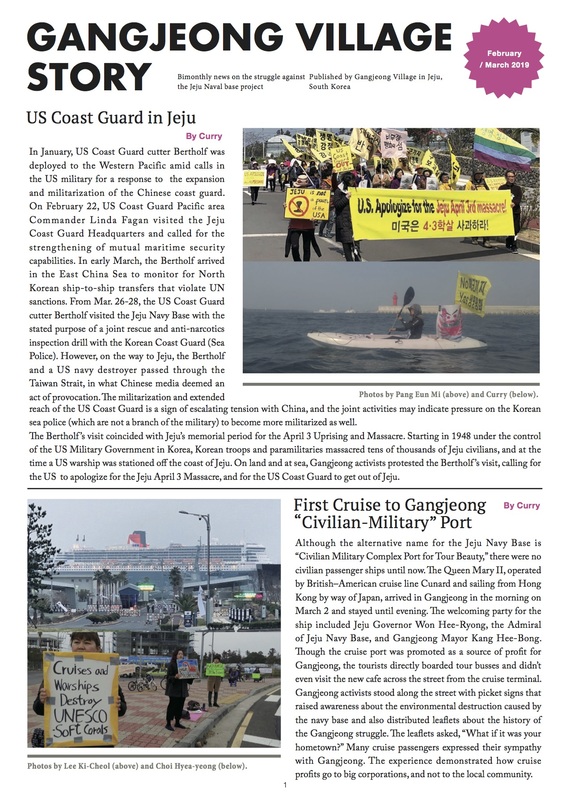 Their reports on Gangjeong can be much found here. Photo by Pang Eunmi/ Fr. 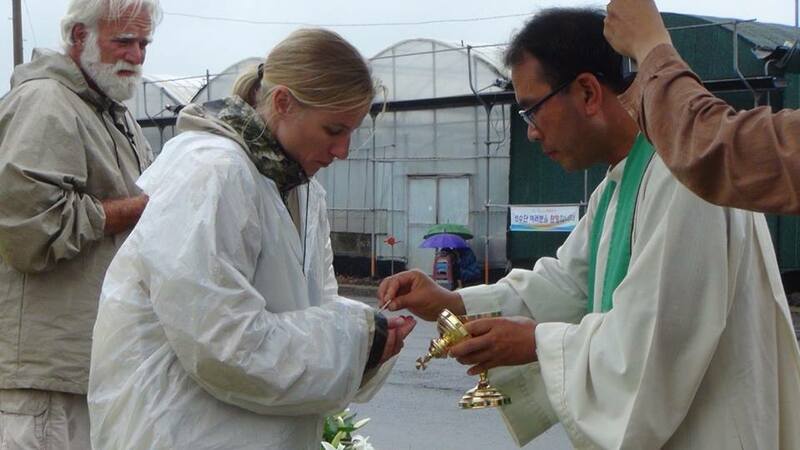 Kim Sung-Hwan gives the Eucharist to Frank Cordaro and Jessica Reznicek in a daily mass in front of the naval base construction gate. I wish to thank Father Kim for allowing me to talk to you today, as a farewell message after my two month stay with you. I want you to know that your daily presence here at the main entrance of this U.S. /South Korean Navy Base, doing the 100 Bow Prayer at 7 a.m. and the Mass, rosary, singing and dancing at 11 a.m. has been one of the most powerful and spiritual experiences of my entire adult life as a Catholic peace and justice activist. As a U.S. Catholic Christian I must confess the U.S. Catholic Church lives in a great spiritual darkness under the influence of the American Imperial culture and the great wealth and properties the Institutional Church owns and our bishops manage. Proof of this spiritual darkness can be seen in all the immoral, unjust, and illegal wars and military interventions the U.S. has inflicted on millions of peoples all over the world, including Korea, in my lifetime, with an almost complete capitulation and cooperation from our bishops and Catholic institutions. In a country where Catholics have confused the modern crucifiers of Jesus with the Crucified Lord, our sacred liturgies are greatly compromised. We are missing some basic Gospel elements that go beyond the bread and wine, the official spoken words and the ordained priest. I have experienced those missing elements every day, here when we celebrate Mass at the entrance of this Navy Base. In all four Gospels, the location of where the story of the Pascal Mystery takes place is central to its meaning. In the Gospels the Jesus story takes place in 1st century occupied Palestine. Here in Gangjeong Village, your Mass, the rosary, singing and dancing take place in an occupied country too — Korea. In all four Gospels the city of Jerusalem and its Temple are made contested space when Jesus and his disciples organize a street demonstration – what we call ‘Palm Sunday’ – and Jesus does his direct action witness in the Temple, what we call the ‘Cleansing of the Temple’. Here in Gangjeong Village, you make this Navy Base contested space every time you celebrate Mass, pray the rosary, sing and dance here at the gate. In all four Gospels, there is a measure of risk that Jesus and his disciple take for confronting the Imperial culture of their times. This accounts for the secrecy that took place with the Holy Thursday gathering in the upper room that ended with Jesus’ arrest, trial and crucifixion. Every time the police carry us off this drive way, they tell us to move voluntarily. They tell us we are breaking the law and that we can be arrested. And this is no empty threat. 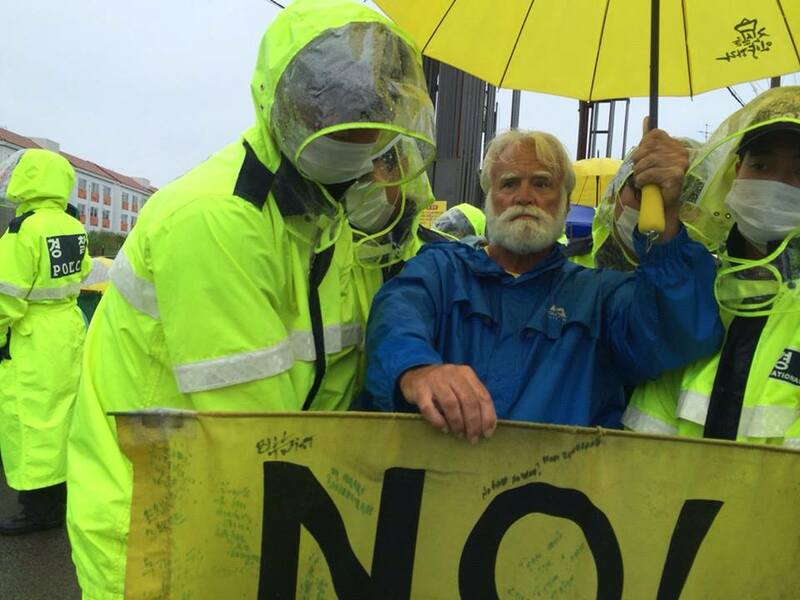 Over the years of your resisting the building of this Navy Base, many of you have been arrested, some of you have done jail time, sometimes for months, even years. When speaking of the real presence of Christ in our Catholic Mass the elements of location, contested space and risk taking are just as important as the bread and wine, the words spoken and an ordained priest. You have all these essential elements every day at the gate and I sense the real presence of Jesus here more than any Mass I have attended in a U.S. parish or Cathedral. In today’s first reading from the book of Genesis (Gn 18:1-15), Abraham and Sarah offer hospitality to three strangers. And in act of offering hospitality, they are told something about themselves they did not know, that within a year Sarah will give birth to a son. May I be so bold as one who has enjoyed your hospitality to share with you what I see happening in your ‘Save Jeju Now’ community. Your beloved Gureombi Rock that Father Mun and many of you sing so lovingly and longingly about at the gate every day is destroyed, ripped apart under tons and tons of cement. And despite your best efforts, this Navy Base is being built. In fact it is close to completion. Your Bishop, Peter Kang said it best, “The destruction of Gureombi Rock is a challenge to the human Civilization and the Creation of God”. And I say, the Navy Base that sits on its broken body is an abomination! These days, your community is in deep grief for your loss of the Gureombi Rock and the inevitable completion of the Navy Base and the changes it will bring in its wake. Know that grief is the basis for the Prophets’ prophetic imagination found in our scriptures. And it was from the grief of disciples’ loss of Jesus on the cross that their eyes and hearts were open to the resurrection of Jesus and their Easter experience that followed. Know also that your struggle is known to many around the world and though you did not save the Gureombi Rock and stop the building of this Navy Base, your continued faithful nonviolent resistance to this god-awful base inspires many peace and justice activists around the world. You should know the death of Gureombi Rock need not mean its end, any more than the death of Jesus was the end of his story. You can find a new beginning of what Gureombi Rock means through your continued nonviolent Faithful resistance to this Navy Base. My prayer for you is that through the grief you are suffering today, you will move from a community that failed to stop the building of this god-awful Navy Base to a community determined to continue your nonviolent resistance to this Navy Base with the goal of converting the culture of death and Empire that sustains this Navy Base and all the military bases that occupy your country. That you will not stop until all US military bases are gone from your lands and the divide that separates South Korea and North Korea will no longer exist. In today’s Gospel reading from Mathew (Mt 8:5-17), a Roman centurion comes to Jesus asking that his servant be healed of a paralyzing, dreadful illness. Today with you, in these last two months I am that Roman centurion asking Jesus to heal my fellow U.S. Christians back home of a paralyzing, dreadful illness! I come from the belly of the Beast. The U.S. Empire spends on its military almost as much as the total amount of money all other countries in the world spends on a yearly bases. We have over 600 military bases in over 100 counties in the world. In 1968, Martin Luther King said, “The U.S. is the greatest purveyor of violence in the World”. Since then, it has only gotten worse. This violent and destructive way of living is built on the legacy of the genocide of our Native American peoples and the enslavement of African Americans. In my lifetime we have destroyed hundreds of “Gureombi Rocks” beginning with the ongoing pollution of our own lands, air and waters. We are the leading force behind a destructive way of living on the planet that is putting all life at risk. We need to be stopped! You can help us heal the paralyzing, dreadful illness that we U.S. Christians suffer by continuing your nonviolent Faithful resistance to this Navy Base and help lead the world in the needed task of disarmament and peace making. I assure you, when I return home to the U.S. 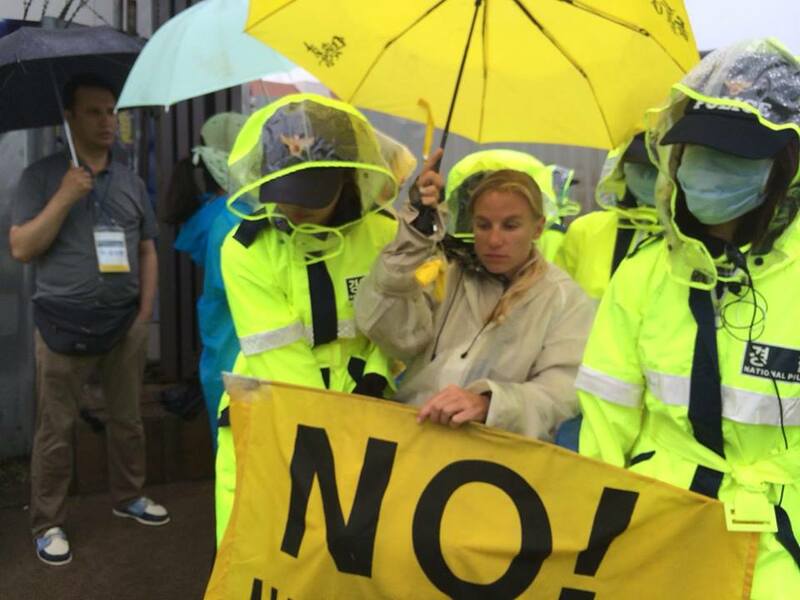 I will sing of your praises and urge my Catholic Worker and peace activist friends to come to Jeju Island and witness with you, here at the entrance of this god awful Navy Base where the real presence of Jesus can be found and the hope for a disarmed world is made possible.